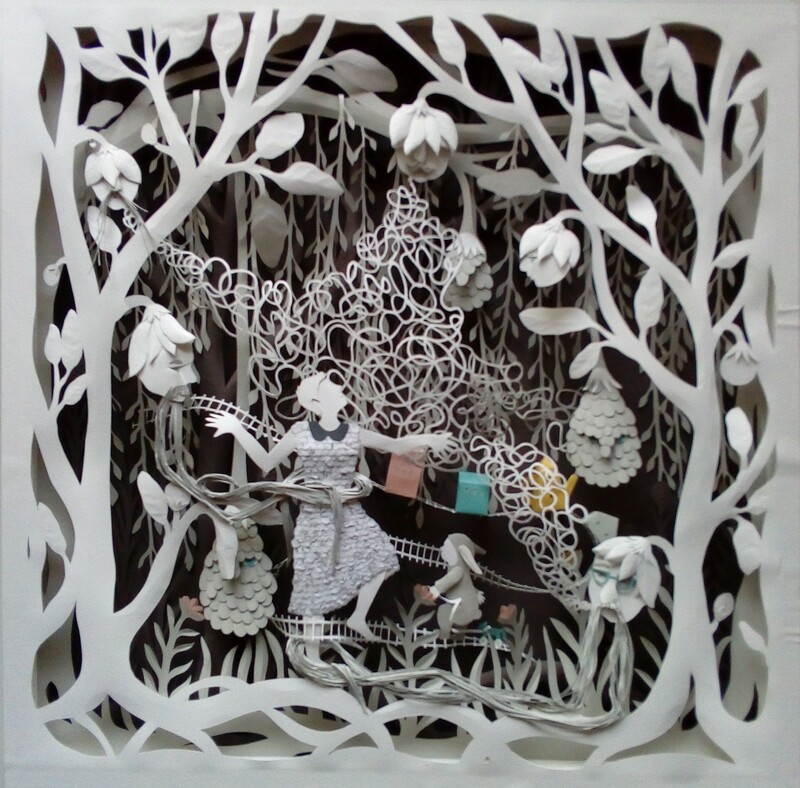 Emerging artists Janaki Lele and Ellen Schlobohm explore cultural and personal connections to paper art and papercutting, reflecting various traditions within their respective cultural heritages. Creating intricate and beautiful contemporary works that re-imagine the papercutting traditions of Sanjhi (India, 16th Century), a spiritual and devotional stenciling technique used to create ceremonial floor decorations with pigments (Rangolis); and Scherenschnitte or “scissor cuts” (Germany, 16th Century) a papercutting fold art tradition of silhouettes, love letters and valentines. The s.il.hou.ette ~ exhibition follows a three month studio residency at Nexus Arts. s.il.hou.ette ~ An exhibition in paper showcases the work of two exceptional emerging South Australian artists whose respective practices explore the delicate and visual-tactile materiality of paper and the art of papercutting. Under the auspices of an emerging artist studio residency at Nexus Arts, Janaki Lele (India / SA) and Ellen Schlobohm (SA) have delved into their individual cultural identities and experiences through distinctive papercutting traditions in the creation of beautiful and exquisite new work. As paper cutting artists in Adelaide, Janaki and Ellen had previously known of one another, aspired to one day work together, and s.il.hou.ette ~ has provided a platform for these refined artists to engage alongside each other, share their own explorations in the paper cutting traditions of Scherenscnitte (Germany) and Sanhji (India), and their love for paper. The somewhat serendipitous coming together of these two culturally diverse artists in s.il.hou.ette ~ began in 2018, as both artists independently came to my attention: through Janaki’s Stories in paper exhibition at the Women and Children’s Hospital; Ellen’s valued involvement and enthusiasm as a disability arts worker and experienced workshop facilitator with Tutti Arts Inc. during their fabulously colourful inter-cultural exhibition Standing Up. Standing Out. at Nexus Arts; and both their passionate disposition towards paper art and papercutting. Paper is a versatile, readily available material with a long history and widespread traditional and contemporary applications. The tactility of paper is something that we experience, and sometimes learn to appreciate, from an early age, in books, at school, or… as art students. It comes in a huge array of sizes, colours, textures, compositions and applications: recycled; brown; waxed; coloured; news-printed; hand-made; textured; of rice pulp or Italian make. Its invention is attributed to Cai Lun in 105 AD in China, and this humble material has an extensive and rich history, making its way to all corners and cultures of the world, revolutionising societies, and art. For a material so readily available today, the delicate and tactile refinements associated with the crafting and use of paper survive in many traditional crafts and paper art forms, which have made their way into contemporary art practices. I recall my first experience of contemporary papercut art as a first-year art student at Charles Darwin University, visiting an exhibition of Quorn-born (SA) artist Sally Smart’s The Exquisite Pirate (YawkYawk), 2007, at the inspirational 24HR Art contemporary art space (now Northern Centre for Contemporary Art) in Darwin. I was mystified at the delicate tactility of the hand-coloured paper depicting bold outlines and silhouettes of pirate ships and treasure chests and female pirates, and the sheer scale of the work, reaching some 4 to 5 metres in height which circumnavigated the entire central gallery. At the artist talk, Smart markedly laughed at how the work was a travelling piece, packing down easily into a suitcase. In the alleyway outside, in the 24HR ArtBoxset window, another exhibit of paper cut work by Australian-born Chinese artist Pamela See, High and Mighty, Lowly and Meek, presented a striking installation of paper cut flowers in a traditional Chinese bright red, alongside stark black insects and absurd and caricatured characters. Moving beyond traditional designs and applications, the delicate arts of papercutting are re-imagined in contemporary practice, yet often steeped in their cultural traditions, imagery and form, as with the work of Chinese-Australian migrant artist Tianli Zu currently on show at the Adelaide Festival Centre, bringing her traditionally influenced ( red mulberry paper) and highly innovative practice to Adelaide audiences in celebration of Chinese New Year, a sensory light show which accentuates the paper cuts negative space through the use of LED lights and complex shadows. Janaki Lele’s own creative relationship to paper developed through her studies in Architecture at the University of New South Wales, rather than a particular cultural tie or tradition. Janaki migrated to Australia on the 15th February 2007, exactly 12 years ago, from Pune, a city in India’s west and sister city to Mumbai, where she had previously lived for the first 12 years of her life. Arriving in Sydney, and living in an apartment adjacent to Centennial Park, one of Janaki’s earliest and most fond impressions of Australia were cockatoos, who would congregate on the 6th floor balcony of her home, screeching loudly and playfully. After her studies, while looking for work and with plenty of time on her hands, she began to create paper cut lamps and dabbled in papercutting. Through her architectural background and a modelling mindset, she liked to explore ways of building layers and texture with paper. Somewhat obsessive about recycling, in reusing materials she discovered in paper a tactile pleasure which offered flexibility, fragility and availability. With a passion for moulding this 2-D material into 3-Dimensional compositions, her work is often inspired by architectural elements, the man-made and built environment; as well as nature and the natural world, creating intricate organic silhouettes and imagery within which the human figure, often representing herself, is nestled; an emotional representation of an inner world imagined through organic form. Janaki often refers to her memories of emotion; an inward-looking person, she persistently keeps track of her thoughts, of what she is feeling; and is continuously amazed by the human mind and its intricacies. In Cultural Chameleon, we are faced with the awkward unease of settling in, of adapting and trying to blend into a new place, a new home, a new culture. The black figure appears warrior-like, clad in colourful sculptural components depicting Australian native flowers in which the character is camouflaged, yet holding at its heart a Lotus, sacred symbol in Indian culture. The restful demeanour and adornments of the central figure seem to imply that the malleability of our outer layer, the projection of ourselves which we decorate for the outside world, can become amalgamated from a variety of sources, an impetus to want to belong that shapes our exterior, and which is often a mechanism of survival. In her work, poetry alongside imagery becomes a form of inner expression for the artist, through a dual channel of visual evocation. Both the poems and the papercuts present us with a sensory and emotional image imparting meaning through symbology. This juxtaposition of artwork and English poetry text is most interesting within the context of a migrant’s individual experience, reflecting a true desire to deeply explore this cultural condition and extract what beautiful outcomes may be found from that journey. Sowing seeds is a potent image on the path to finding belonging, for spreading roots, or anchoring oneself to a ground. This relationship to ground, to sacred space, is also referenced in her floor work, Rangoli. A rangoli is a traditional Indian ceremonial floor decoration used in temples and at significant events or celebrations. Traditionally made from fine white marble dust and drafted by hand on the ground in the fashion of mandalas, rangolis are often also created from paper cut ‘stencils’ known as Sanhji, featuring designs that are either floral and fluid in repeating patterns, or symmetrical and geometric, sometimes depicting gods & goddesses. These floor designs are created to frame spaces in celebration and worship of important milestones in personal and spiritual life. Janaki’s mother often creates rangolis in their home in India. “Little ones, which are quite contemporary” and made right outside their apartment, often only to the size of one of their ground tiles. She does this to celebrate festivals and really for anything at all, as a gesture of gratitude, joy and as a personalised devotional tradition. Janaki’s own floor work weaves a repeating pattern around the central pillar of the gallery, the image of a red crested cockatoo and a bright red lotus flower and seed pod. Again she juxtaposes her inherited cultural identities, the ephemeral and somewhat performative repeating stenciled floor design centered around symbolic imagery that has been important to her and her experiences as an Indian person migrating to Australia. For Janaki, rangolis always come from a happy place, something auspicious and joyful, an assertion of personal cultural heritage. For Ellen Schlobohm, who grew up in country SA, in the Clare region and Barossa Valley, she feels that her connection to her German heritage and the traditions she remembers is sadly fading since the passing of her grandparents. For her, this residency offered an opportunity to reconnect with her heritage and her personal trajectories, exploring and interpreting personal memory through imagery, with an emphasis onGerman papercutting traditions. Papercutting in Germany and Switzerland, known as Scherenschnitte or “scissor cuts”, was developed in the 16th Century and later taken to America and elsewhere by German migrants. Using increasingly available and low-cost materials, this form of paper folk art often involved the cutting out of small silhouettes, often in black paper: profiles of people, symmetrical landscape designs and other outlines were often used in the making of love letters, valentine cards, significant personal or commemorative documents such as birth or wedding certificates, as well as decorative items for gifts and the home. As a child, her grandparents would have food sent to them from Germany, and Gummi Bears were a favourite, even before they were available in Australia. Ellen cherishes these memories and still, Gummi bears bring her a sense of happiness and joy. In her work Gummibärchen, Ellen has used the silhouette of gummi bears as an instigator for experimentation, reflection and personal symbolism. 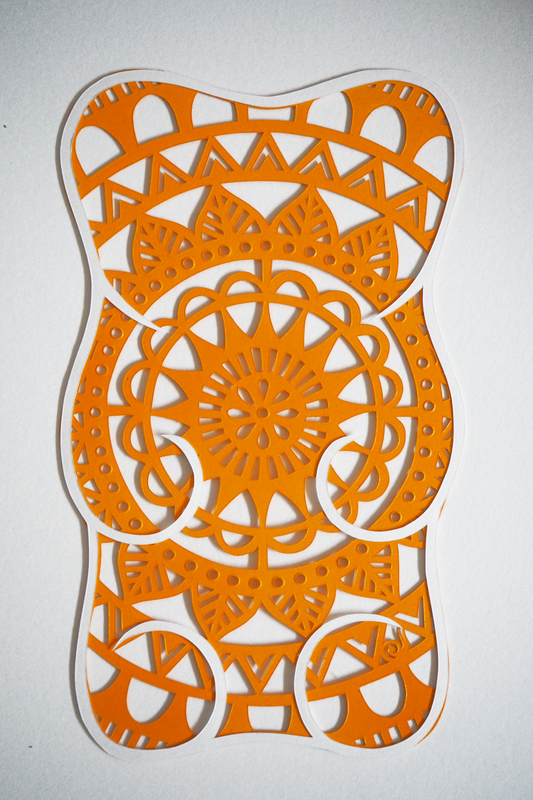 Creating a quaint installation of papercut bears hung in a line slightly away from the wall, the amplified forms of these fuzzy sweets have been incised with patterns and symbols. These forms are recurring designs she uses in her practice, linking her to her paper craft and personal heritage, inviting us to contemplate with her the childhood charm of this delectable confectionary, which she knew affectionately as ‘gummibärchen’. Ellen’s extensive creative practice, involving jewellery, papercutting, printmaking and public art, is often inspired by nature, symmetry, botany, patterns and crisp bold designs, as well as a desire to experiment and try new things, or use paper in new ways. In the hanging work Silhouette, the artist juxtaposes two large cutout outlines of her own profile, one black and one white, that cast delightful shadow play onto the wall and each other as they sway in the space. Sitting with this exhibition, shadows are a felt presence, creating outlines beyond the physical positive and negative space of the works, adding dimensional texture and depth, as though there is more to be found beyond the richness that we already can see. In Hearth Blessings, Ellen explores the foundations of her relationship to paper cut art in a wall installation of personal objects that Ellen has carefully selected: cherished memorabilia and other items which remind or connect her to important moments in her life. Set upon a series of shelves, small German folk figurines, native flowers, a collection of books and other personal items are fringed with a simple heart-shaped scherenschnitte motif. In the style of a traditional hearth decoration, the hearth blessing is cut from paper that features crossword puzzles. Another fond association with her Grandparents, the presence of crosswords is an affectionate acknowledgement of their influence, memory and shared heritage, as her Oma, after migrating to Australia, learnt English through crosswords and watching TV. In the Schlobohm family, crosswords were always a happy affair, at Christmas becoming quite the topic of conversation as games were played and the puzzles were debated. Interestingly, I personally relate to components of this work, as object-associations can maintain strong bonds with our past. My own French migrant grandparents were very similar in their passing on of a similar crossword appreciation in their Adelaide household, my Grandmother learning English from them. A Saturday and Sunday morning picture of my Papy and Mamie sitting in their dressing gowns at the kitchen table over a breakfast of coffee and buttered baguette, reading the newspaper and doing crosswords strikes a chord deep within me. In a sense, Hearth Blessings is like an offering to memory and cherished experience, similarly to Janaki Lele’s ceremonial inspired floor artwork, which seeks to celebrate a connection to culture, place, family and heritage. In being allowed the opportunity to reflect on these paper cutting traditions and on very personal experiences related to their cultural upbringing and journeys, the artists have created an exquisitely poetic and moving exhibition. In the studio residency, Ellen found joy in having an external studio space, where time to consecrate to the exploration of ideas and making of work, and the ability to engage in conversations with another skilled paper cutting artist were highlights of her experience as she has explored the very affectionate and assertive realms of personal and cultural memory. While Janaki relates that her residency at Nexus Arts came to her at a very opportune time, with sudden personal circumstances soon forcing her to return to India, this exhibition has allowed her to spend time reflecting on some of her experiences in Australia and the feelings she has been faced with being a person from a different culture. Australia has been an uneasy and also inspiring home, and returning to India will be a process of re-learning to be in her other home again. As she is poised to step back into the unknown, her poems and paper cuts are a parting reflection on this stage of her journey, wherein she feels she has come to terms with a basic and eye opening lesson: as a displaced and inward person, thinking about everything through other people’s eyes or view point is replaced by her own, coming to terms with the ways in which she should and shouldn’t look at herself.Like the silhouette and its shadow, one is of illumination of the self and the other a projection that reveals the unseen layers of experience and feeling in between. André would like to thank the artists for their intimate and delicate work, and their generous sharing of their artmaking and lovely personal narratives. An Architect, obsessive recycler and a Paper Artist, Janaki is an Indian born visual artist currently working in Australia. Her creations are a result of her endless explorations with paper. She enjoys tackling the two-fold challenge of fragility and flexibility exhibited by her chosen medium. Lele strives to create art that incites amusement and curiosity in its viewers but leaves an undemanding and modest footprint on the planet. Ellen Schlobohm is a paper artist who has been working in this medium for the past ten years. Her work is created by meticulously hand cutting paper to transform a blank sheet into a delicate tableau. Often Schlobohm’s pieces are influenced by nature and include botanical imagery and patterns. She is drawn to the simplicity and strength of paper and loves to watch it come to life as each cut is made.